By now, you’ve probably noticed a clear theme with our Smart Apps: a typically time-consuming and paper-intensive process is transformed with an easy-to-use online solution. The latest addition to the family of Smart Apps, the Time Off Request app, is no exception. This new app is a simple and affordable way to capture and oversee the flurry of time-off requests businesses manage week after week — all in a single glance. Employers can eliminate the trail of emails, texts and handwritten notes and, instead, handle time off requests electronically. 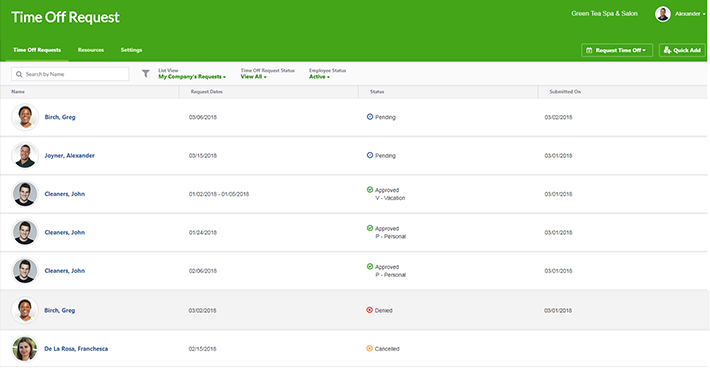 A consistent, step-by-step workflow allows employees to make requests directly within the app, followed by supervisors and managers approving or denying the requests. An organized, on-screen visibility lets managers view and filter multiple time-off requests to make the most informed staffing decisions. Just as important, the app reduces some of the compliance complexities related to granting employee time off, due to the practical guidance in the Resources section. 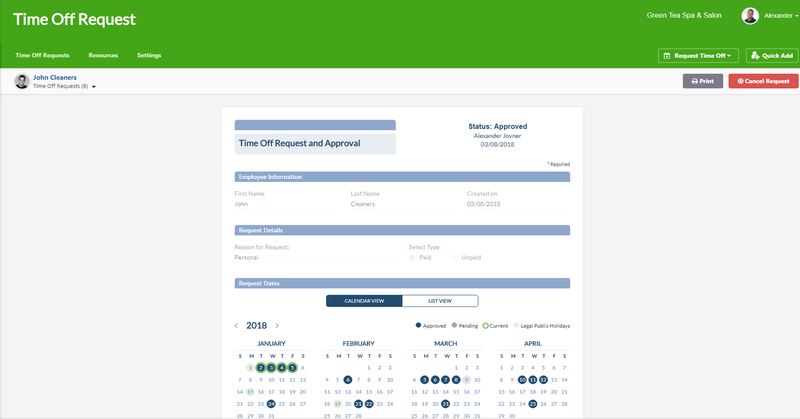 Plus, like many of our other apps that were inspired by existing, top-selling paper forms, the Time Off Request App offers the best of both worlds. Customers will appreciate the familiar, straightforward functionality of the Time Off Request & Approval form (which we’ve sold to nearly 4,000 customers in the past 30 years), combined with relevant and value-added features only available through software. Many businesses lack a formal or reliable method for managing time-off requests. They deal with the constant interruptions from employees, jotting down reminders on sticky notes or a desk blotter, or attempting to maintain a spreadsheet. Or worst, they rely on their memory regarding earlier time-off conversations, with no written documentation. In fact, in our recent Small Business in the U.S. and Time Off Requests survey, more than 30% of the 300+ respondents consider “remembering when an employee will be out” to be their biggest pain point. Calendar view — Shows the current request, along with all pending and approved requests. Users can toggle between years on a single form, unlike the paper form that only covers a specific year. Absence code synchronicity — Depending on how they track time off and absences, employers can set up a matching absence code list for both the Time Off Request and Attendance Calendar apps. That way, when a request is approved, the coded absence will automatically appear in the Attendance Calendar app. Who’s out during a request — Indicates all employees with pending and approved requests in the same timeframe of an incoming request to help managers maintain proper staffing. Built-in workflow — The entire process is extremely simple! Request submitted => email notification sent to manager => manager clicks on link in email => manager approves or denies the on-screen request => employee receives an email notification of manager’s decision. Managing time-off requests doesn’t have to be a frustrating burden. With the new Time Off Request Smart App, you can end the back-and-forth confusion and approve or deny requests with a single click. The app takes care of the rest. It’s like taking a vacation from the everyday drain! Since joining ComplyRight in 2015, Leanne has brought innovation, creativity, and passion to the ComplyRight family of brands. Now on the Smart Apps Product Team, Leanne is focused on creating the next generation of HR solutions. As the Product Lead, Leanne drives the development of features our customers want us to build next (and those they don't even know they've wanted yet...). She is driven to craft experiences that are effortless, refined, and delightful with the support of our creative and hard-working development team. Fun Fact: Leanne has a passion for healthy living but is somehow always hungry.